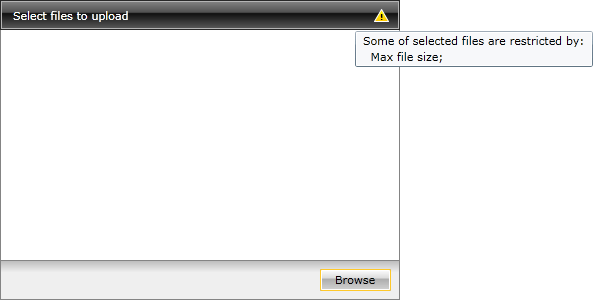 When the maximum file size gets exceeded, the FileTooLarge event gets raised. More about the events can be found here. If the selected file is larger than 1 MB, it won't be added to the list and the RadUpload will display a notification icon and a tooltip with an error message. You can see the size of each file in the list on the right side of its container. When the total upload size gets exceeded the UploadSizeExceeded event gets raised. More about the events can be found here. If the selected files make the total upload size larger than 2 MB, the files, that are over the limit, won't be added to the list and the RadUpload will display a notification icon and a tooltip with an error message. You can see the total size of the files in the list on the right side of the total details container. To limit the count of the files that can be uploaded at a time, you have to set the MaxFileCount property of the RadUpload control. Here is an example of a RadUpload with MaxFileCount set to 2 (the default value is int.MaxValue). When the maximum file size gets exceeded, the FileCountExceeded event gets raised. More about the events can be found here. If the count of the files in the list becomes greater than the allowed one, the files that are over the count, won't be added to the list and the RadUpload will display a notification icon and a tooltip with an error message.